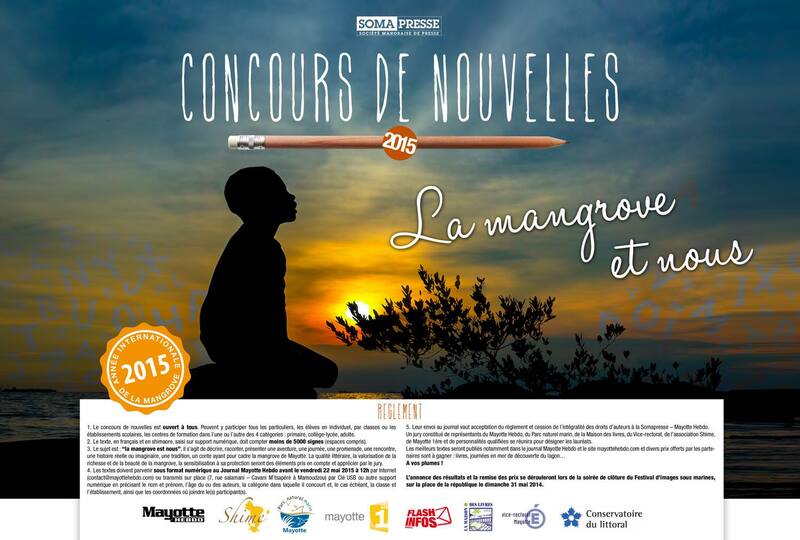 Within the framework of the 21st edition of the Images of the Sea Festival, the Somapresse and its partners – including the Conservatoire du littoral, the Mayotte Natural Marine Park and Mayotte’s vice-chancellor – will be organizing a short story competition for the second year running. As this year is focused on mangroves, the theme chosen for the stories is The mangrove and us. Ready, set, write! Discover, recount, present an adventure, a walk, a meeting with someone, a tale or a tradition set in a mangrove. This competition is open to all: primary schoolchildren, middle school/high school pupils or adults, and the text can be written in French or Shimaore. The end date for sending in your short story is Friday, May 22 at midday. The results and reward ceremony will take place during the last evening of the Underwater Images Festival, at Place de la République in Mamoudzou, on Sunday, Mai 31, 2015.